Kicking off Jump Festa 2016, Square Enix posted a new trailer for World of Final Fantasy. The trailer shows twin siblings Reynn and Lann as they enter the world of Grymoire to raise classic Final Fantasy creatures as allies. We also get to see more of super-deformed Cloud and Lightning, as well as Yuna and Faris (with her sea-dragon Syldra). 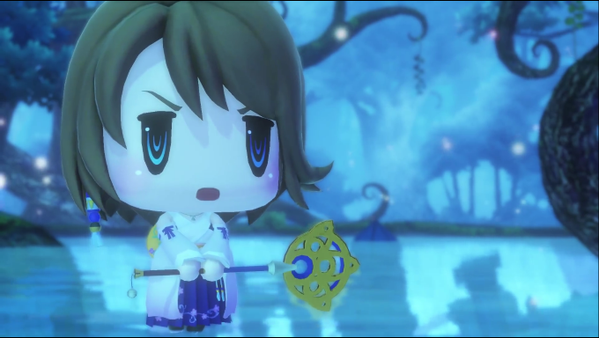 World of Final Fantasy is set to release in 2016 on PlayStation 4 and PlayStation Vita. Come back to Nova Crystallis for more on Square Enix games during Jump Festa 2016 and more! For now, enjoy the trailer. Posted in Jump Festa 2016, World of Final Fantasy. “Coming 2016”, I notice that it uses the same font from FFXV E3 2013 Trailers. Yuna looks like a Crystal Meth head… WHAT HAPPEN?!?! ?